I have just spent a little over two weeks in Melbourne; I arrived on occasion of a conference on iOS development, but stayed longer to give me time to catch up with friends. It was my first visit to my old hometown in almost five years. Melbourne is, I am relieved to say, still here. Just about. Some things are new, some things are gone, and some things remain constant. Gentrification keeps pushing the virtual Yarra that divides bourgeois and grungy Melbourne northward; it'd now be somewhere around Merri Creek and Brunswick Road. Fitzroy feels a bit more like South Yarra, a bit brasher and less bohemian. Hip-hop, laptop R&B and house music have largely displaced skronky/jangly indie-rock as its soundtrack. Brunswick Street is now is also a destination for stag/hen-party buses. Some parts of it are gone (PolyEster Books has closed down, its shopfront a sad shell with a LEASED sign on it and the old roof sign awaiting its inevitable demolition, and the T-shirt shop Tomorrow Never Knows appears to have closed as well), while others remain (PolyEster Records, happily, is still going strong, though they've gotten rid of the neon Dobbshead that was on the wall, as is Dixon Recycled, and Bar Open is still hosting interesting gigs). Smith Street, once colloquially known as “Smack Street”, is reshaping itself as a playground for young people with disposable income, featuring, among other things, several video-game bars (including the arcade-machine bar Pixel Alley) and a burger joint housed inside the shell of an old Hitachi train on the roof of a building (the experience of being inside such a train and it being air-conditioned will be incongruous to those old enough to remember riding in them), not to mention some very nice-looking new flats nearby. There is a new generation of hipster/bro hybrids making Fitzroy their stomping ground. North Fitzroy is largely bourgeois and sterile; bands still play at the Pinnacle, but the Empress, once the crucible of the Fair Go 4 Live Music movement, is under new management and has replaced its bandroom with a beer garden; East Brunswick and Thornbury seem to be becoming more interesting, and Northcote is steadily gentrifying. There are blocks of luxury flats going up everywhere, though most of them have no more than three stories, either because of zoning requirements or perhaps to avoid scaring away buyers from Asia. Some things remain the same. The trams keep trundling along, with minor route adjustments. The radio station 3RRR, now 40 years old, is going strong as an institution of the alternative Melbourne; an exhibition on its history just finished at the State Library of Victoria, and its stickers are ubiquitous, particularly in the inner north. 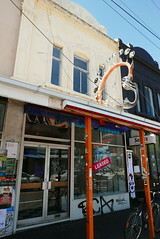 The live music scene continues apace, in venues such as the Old Bar, Bar Open and the Northcote Social Club. (I saw three gigs in the latter: Lowtide, Pikelet and my favourite band from when I lived in Melbourne, Ninetynine, who are still going strong.) Street art remains an institution in Melbourne, a city where aerosol-art-festooned laneways swarm with tourists and wedding photo shoots and businesses hire “writers“ to decorate their walls with thematic pieces. And the arrival of H&M, in one oddly laid out shop occupying the former General Post Office, doesn't seem to have put Dangerfield out of business. There are also signs of progress. 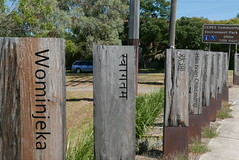 Reconciliation with Australia's indigenous population seems to be making tentative symbolic advances, with signs acknowledging the Wurundjeri as traditional owners, and the Wurundjeri word for welcome (“wominjeka”) appearing on signage. 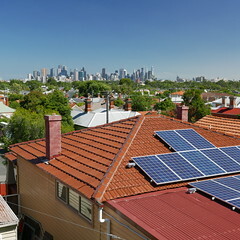 Solar panels are on roofs everywhere. Cycling as transport seems to be increasingly popular, despite Victoria's mandatory helmet laws (which may have helped scuttle the city's Paris-style bike-rental scheme). And work is beginning on the state's first big public-transport project since the City Loop, the Metro Tunnel, a new underground rail route bringing Melbourne into the club of cities with a subway; currently, one side street near RMIT is largely boarded off to build a shaft for the tunnel boring machines, and both RMIT and Melbourne University are bracing for the hit to student numbers that three years of nearby disruptive works will pose. The playlists linked from the program guide now go all the way back to the dawn of time (or 2004, in any case). (They had those playlists online in the old site, but the only way to get at them was to manually try different numbers in the aforementioned CGI arguments; here, they're indexed in nicely paginated indices going as far back as necessary.) Here is the first International Pop Underground playlist they posted online; it's interesting to note that Carew played My Favorite's Homeless Club Kids and various Stephin Merritt-related projects that week. Also, RRR's website will have a subscribers-only section, which will apparently include expanded audio archives. Not sure what exactly this will entail, or indeed what Australian copyright law will allow. The station's evolution into an example beloved of politicians boasting about Melbourne as Australia's cultural capital is ironic, given that for many years it had to fight for survival in an environment unsympathetic to its more outre tendencies. In an attempt to reduce "accidental" broadcast of unsound material, white nail polish was used to paint over questionable tracks in the station record library, but use of the word "f--k" proved difficult to eradicate when popular culture had embraced it. Some details are lost to history - such as whether the station went off air for a few hours each afternoon in its early days to let the ancient transmitter cool down or to let the RMIT electrical engineering students have a go. One thing that won't be forgotten is the massive public support that enabled Triple R to narrowly escape one of several death sentences when in 1981 the board voted to close it down, before agreeing to give staff and volunteers five weeks to raise $50,000. Nowadays, RRR's desperate struggles for survival are largely in the past; the station now owns its new premises, and, the article says, has attained "the veneer of middle-aged stability". The programmes still have the same feel of passionate amateurism they have had for as long as I've been listening (since the 1990s). As for political controversy, I suspect that, as Australia's commercial media become increasingly concentrated and dumbed-down and government-funded media become more timid and/or propagandistic, more attention (both sympathetic and hostile) will focus on stations like RRR, and there may be more battles ahead. There is now a book on the history of RRR, titled Radio City, by Mark Phillips. It is available from the station. I tuned into the 3RRR Breakfasters this morning (streamed over the internet and time-delayed) and found that sometime Rocknerd columnist Clem Bastow is now reading the news. I wonder whether she (being a coolsie chat and all) was responsible for the Mid-State Orange song being played after the news. Anything that breaks up the monotony of the Breakfasters playlist is, in my opinion, welcome. The 3RRR summer break is over, which means that the normal breakfast team is back. Which is a pity, because I much preferred Richard Watts' summer guest breakfast show. Watts is a writer, spoken-word artist, DJ and regular of the Melbourne arts scene; when he spoke, it was thoughtfully, and about things from the arts to current issues. He had other RRR presenters stepping in to co-present, and they were similarly intelligent people like Alicia Sometimes. Though most of the show wasn't talk but music; the music was an eclectic selection, spanning decades, and I don't recall him playing the same track twice; the music was radio programming at its finest, in the same tradition as John Peel. I'm thinking of reprogramming my RRR recording scripts to skip the breakfast show altogether and wake me to different programmes. Recently discovered courtesy of 3RRR's International Pop Underground: this gem. Ostensibly a Japanese children's choir singing cheerful songs with chromatic percussion, drums, funky basslines and fuzz/wah guitar, it was actually produced by two French hipsters in 1971; the Japanese words they sing (i.e., things like "Yamamoto Kakapote") may or may not mean anything. Think of it as a sort of Polyphonic Spree combined with Momus-esque orientalism. Having lived in London for a little over a year, and having access to the ubiquitous British broadband internet, Your Humble Narrator has recently been experimenting with tuning into 3RRR (an independent radio station in Melbourne), by means of its internet streaming facilities. I now have the means to more or less automatically spool various programmes to hard disk to listen to at a later time; technical details will be published here once the bugs are known to have been ironed out. This evening, I listened to the most recent Local And/Or General, a weekly 2-hour showcase of new independent/unsigned/live music from Melbourne, for the first time since leaving Melbourne. It's good to hear some good Melbourne bands again. And there were some good things there. In particular, they played two songs and an interview by a new project named Holidays On Ice, which sounded really good. Holidays On Ice are a project involving numerous Australian musicians, including Angie Hart of Frente!/Splendid and members of a few other bands. They have a new album titled Playing Boyfriends and Girlfriends, which sounds somewhere between Yo La Tengo and Saint Etienne, with bits of Stereolab and Architecture In Helsinki in the mixture as well. I'm probably going to order a copy. 3RRR just played the title track from (a sampler of) the upcoming Ninetynine album, The Process. Hmmm... on first impression, it sounds impressive. It has a lot more energy and punch than most of their earlier recorded material (which tended towards the meandering in places, at least in my perception). Of course, the songs sound different in a studio recording than in a live show; it doesn't have quite that reverberating adrenaline rush of seeing them live, but I could hear a finer, more layered quality to it. If the title cut is representative of the album, it's set to be impressive indeed. Listening the Far and Wide on 3RRR now; they just played a song from a new/upcoming Trembling Blue Stars album. Not bad; I may have to reassess my view of Bob Wratten's post-Field Mice solo career as mind-numbingly dull. At least it wasn't a weepy guitar-strumming come-back-to-me-I-still-love-you number like most of their first album. Oh yes, and the Dot Allison song they played sounds interesting... I'll have to track that down; that and a CD copy of that King of Woolworths EP. Oh, and I didn't get a copy of Björk's Vespertine, which they were giving away, despite having programmed 3RRR's number into the autodialer here.